Aerobic exercise, also referred to as cardiovascular exercises, are those workouts that get your heart pumping within your target heart rate zone. As you perform cardio routines, you are moving your arms and legs with a rhythmic movement that allows your body to pump blood and oxygen to all parts of your body. This strengthens your heart, burns calories and burns fat. There are many different types of aerobics so your workout routine will never get boring. Many activities you may perform daily could be considered cardiovascular exercises. Things like mowing the lawn, walking the dog or even going up and down the stairs to do laundry. But to really get the benefit for your heart, you want to try incorporating a structured workout routine that includes activities such as walking, running, swimming, bicycling, dancing or some form of higher intensity activities. If you are looking to lose weight and burn fat then aerobic exercises are one of the best ways to accomplish this. With a cardio workout, not only are you getting the medical benefits of reducing risks of certain diseases, you will be burning calories and fat. Low to medium impact cardio workouts burn approximately 60% of fat of the total calories burned during exercise. This means that if you did a brisk walk for 45 minutes and burned approximately 250 calories you would be burning 150 fat calories. The total number of calories you burn will depend on your age, gender, weight and activity. The best way to see how many calories you burned during exercise is to use an interactive exercise calorie calculator. Although the low to medium intense cardio workouts bring you a higher percent of fat burned, they also give you a lower total calories burned. With higher impact cardio workouts you can actually burn more calories, and approximately 35% of this would be fat used for energy. So, depending on the total calories burned, you may get a higher fat burn with the high impact aerobics. However, you need to ensure you can last the full duration at this high intense level to get the most out of your fat burning exercises. When planning your weekly exercise routine, you should always plan for both aerobic and strength training exercises to get the most out of your weight loss routines. Be sure to make your cardio workouts varied and fun. By adding variety, you will be more likely to stick to your workouts. There are several different types of cardio workouts. You can purchase DVD’s that will combine both aerobic and strength training. You can go for a brisk walk, jogging or running. Running is a great aerobic exercise but takes some training and dedication. If you want to give it a try here's an article for the beginning runner from a site dedicated to running. Additionally, you could join a gym and use their training machines such as the treadmill or elliptical machines or purchase your own equipment. Another way to mix it up with aerobic and anaerobic exercises are to try high intense interval training , or circuit training. One of the downfalls of some aerobics are the impact to your body’s joints; especially the knees. If you have soreness in your joints or are past the age of 40, like me, then try doing some aerobics that are friendlier on the joints. One of my favorite joint friendly exercises is water aerobics exercises. Try a brisk walk instead of running or use an elliptical machine instead of the treadmill. If using a treadmill, keep it at a brisk walk and use the incline to get the benefit of a challenging workout. Listening to music while you walk is a great energizer and makes it more fun. Here's a great article on walking music that will help you select the right sounds for your walk. A great alternative to walking is to get out your bike. Biking for exercise gives you all the benefits of aerobic exercise plus you get to enjoy the weather without stressing your joints. Regardless of what type of cardio workout you choose, you should aim to do at least 30 minutes of cardio exercises at least 3 to 4 times a week. This will help minimize the risk of certain diseases as well as the benefits of losing weight. To find out how you can benefit from aerobic exercise be sure to check out this article on the health benefits of exercise. Strength training are workouts that add resistance in order to build lean muscle mass. The more lean muscles you have the higher your metabolism. This means you burn more calories. 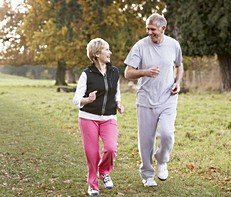 Walking is a great cardiovascular workout. Your walk can be brisk and energized or it can be more casual. Anaerobics go beyond just strength training. With a high intense workout, your body begins to switch from using oxygen to using up your carbohydrates.